Colourful travel journal providing plenty of pre, during and post trip activities for young and old(er) travellers alike. 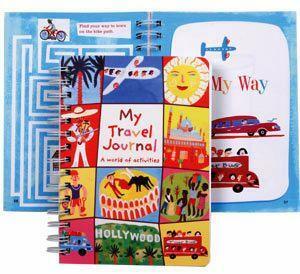 Mudpuppy's My Travel Journal is a great way to help kids manage and remember a big trip. Hollywood, bullfights, mosques and minarets, palm trees, double-decker tour buses, camels, half-timbered houses--Christopher Carr's worldwide illustrations were inspired by the book My Granny Went to Market--A Round-the-World Counting Rhyme. Sections include:'Before I Go', 'On my way', 'Looking around', 'New friends', 'Sightseeing', 'Going home', 'Notes'. 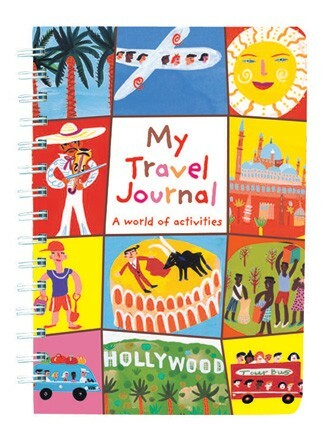 Range of activities - crosswords, mazes, quiz, diary section.